The third generation of Honda Insight is here with the 2019 Honda Insight model. The model made its Canadian debut on Wednesday at the Vancouver International Auto Show. This is the third generation model of the hybrid vehicle and is stylistically similar to the concept of the model that Honda unveiled last year. This is Honda’s third hybrid vehicle on the market currently, joining the ranks of the Honda Clarity and 2018 Honda Accord Hybrid. The style of the model borrows from the style of the Civic and the Accord. The model has a low and wide stance, which is accented by Honda’s signature “flying wing” grille and horizontal, broad headlights and taillights. The head and taillights are reminiscent of the stylings of the 2018 Accord model. The new production model also shares a similar chassis with the Honda Civic models, with an additional 1.5 inches more than the Civic, thanks to a lengthened wheelbase. The 2019 Honda Insight also features a 15.1 cubic-foot trunk, which is 3 cubic feet larger than the trunk of the Civic model. Under the hood, the third generation of Honda’s two-motor hybrid system is housed. The engine features a 1.5-liter Atkinson cycle engine, an electric propulsion motor, and a lithium-ion battery pack. Drivers have three models available to them: Normal, Econ, and Sport. This allows the driver behind the wheel the opportunity to customize their experience to favour either performance or fuel efficiency. When Normal mode is selected, the model can run on all-electric driving for short distances. 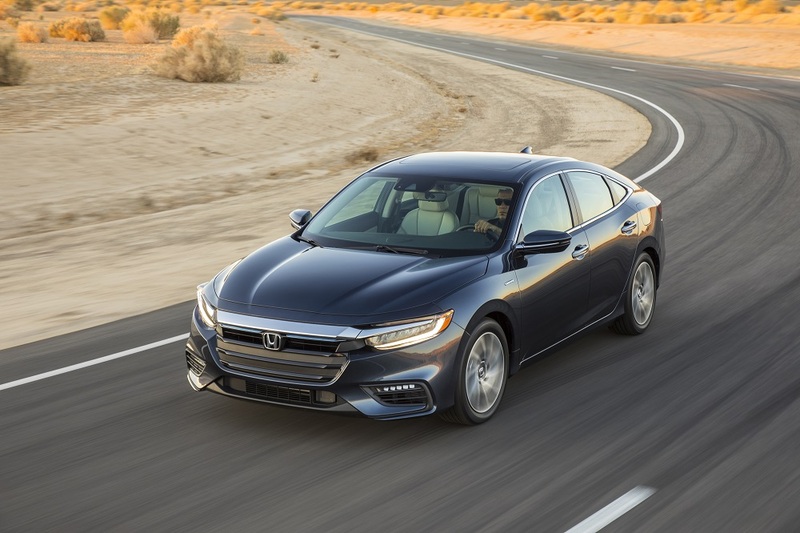 The 2019 Honda Insight is set apart from other Hybrid models by its ability to work without a required conventional automatic transmission – instead, the electric propulsion motor directly powers the drive axles. The 2019 model will be available in two trims only: Standard and Touring. Standard features include: LED headlights and taillights, LED daytime running lights, 17-inch aluminium alloy wheels, heated front seats, push-button start, 60/40 folding rear seats, and more. The Touring model comes equipped with all standard features, as well as rain-sensing wipers, a power moonroof, perforated leather seating, heated rear seats, the Honda Satellite-Linked Navigation System, 4G LTE W-iF and more. For more information on the 2019 Honda Insight, or any of Honda’s hybrid models, visit Henley Honda today!